In case you haven’t heard, Mark Mulder could be joining That Guy Who Used to Play First Base and David Freese in Anaheim this season. Mulder signed a minor league contract with the Angels as he attempts to return to the majors. Now, chances are when you think of Mark Mulder’s career with the Cardinals, you’re some combination of disappointed or angry since Walt Jocketty traded Danny Haren, Kiko Calero and Daric Barton to obtain him on Dec. 18, 2004. Mulder’s four-year career as a Cardinal only included 55 appearances due to shoulder injuries that forced him into retirement after the 2008 season. And you don’t even want to look up the numbers for his very limited 2007 and 2008 seasons — some things are best left in the past. 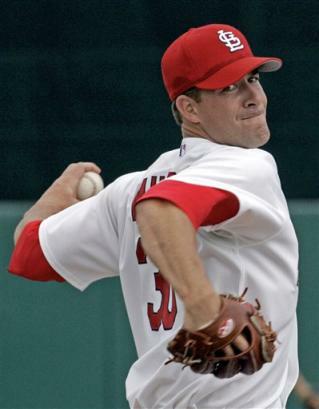 However, Mulder’s first season as a Card in 2005 was very good — he was 16-8 with a 3.64 ERA in 32 starts. The best of those was on April 23, just his fourth start as a Cardinal, when he threw a 10-inning, 101-pitch, five-hit shutout as St. Louis beat the Houston Astros 1-0. Roger Clemens started for the Astros and lasted seven obviously scoreless innings. The winning run scored when Larry Walker drove in Reggie Sanders, who’d singled to start the inning and advanced to second on a groundout by (who else but) David Eckstein. All the best to Mark in his comeback bid — it would be cool to see him pitch in the big leagues again. This entry was posted in General Cardinals and tagged 2005 season, David Eckstein, Houston Astros, Larry Walker, Mark Mulder, Reggie Sanders, Roger Clemens, St. Louis Cardinals, That Guy Who Used to Play First Base, Throwback Thursday by Christine Coleman. Bookmark the permalink.